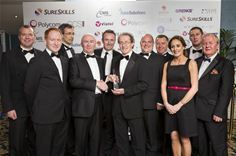 Viatel has been named Company of the Year at the Tech Excellence Awards at a gala event held at the Ballsbridge Hotel in Dublin, where 500 luminaries from the technology sector gathered to celebrate a year of innovation and commercial success. The Awards were adjudicated by industry experts Eoin O’Driscoll (Forfas), Dr Jim Mountjoy (Euristix), Tom McCarthy (HelmAG), Peter McManamon (Parthus Technologies), Dr Seán Baker (IONA Technologies), and Karl Flannery (Storm Technology). Viatel provides Connectivity and ICT solutions tailored specifically for larger enterprise, public sector, wholesale and carrier customers across Europe. Viatel leverages an extensive portfolio of leading voice, cloud, managed services and data solutions with its wholly owned European fibre and data centre infrastructure. It’s advanced fibre optic backbone network connects 8 countries, 35 main cities, over 150 European data centres, and has metro fibre reach into the major carrier houses, data centres and the main Internet Exchanges. With data centres in Dublin, London, Amsterdam, Paris and Brussels, Viatel also owns over 8,500km of fibre network infrastructure which it has equipped with high capacity optical DWDM technology and multi service platforms. Viatel is a preferred connectivity partner of London Stock Exchange, and is directly connected to the largest content distribution networks, public cloud platforms, and internet companies globally.